Jacob and Esau are the twin sons of Isaac and Rebecca. Even though they were twins, they were worlds apart. Esau was a red-head who enjoyed hunting and being in the field. He was admired by his father, Isaac. Jacob - whose name originates from the Hebrew word a-kev (a heel) because he held his brother's heel at birth - preferred to stay by the tent and study. He was admired by his mother, Rebecca. One day, Esau returned hungry from the field and Jacob had a dish prepared. Esau begged Jacob to give him the dish to eat, otherwise he would die from hunger. Jacob gives his brother the dish, but with the condition that Esau will forfeit the blessing of the first born to him. 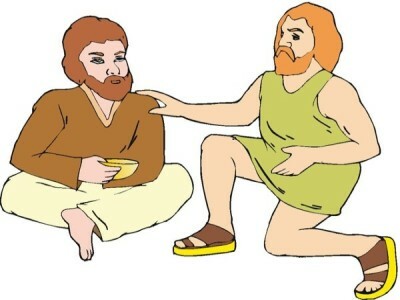 Later, Isaac, an old man with poor eyesight, asks Esau to prepare him a great meal before he gives him his blessing. Rebecca overhears Isaac and plots with Jacob to deceive Isaac so that Jacob may receive the blessing instead. To do so, Jacob covers his arms with fur so that he may be hairy like Esau and make Isaac believe that he is Esau. The plan works and Jacob receives the blessing. Esau becomes very angry upon finding out the news, leaving Rebecca with no other choice but to sends Jacob away to her brother in Haran in order to protect him. Our focus in class will be about family values and relationships between siblings. What guidelines can we create so we can have great, positive relationships with our brothers and sisters? Does it ever happen to you that you want something so badly, you will do anything to get it? What can we do instead?